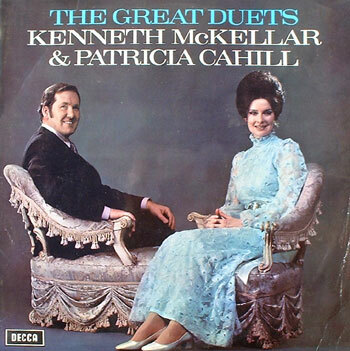 Kenneth McKellar was a tenor I had always admired. I loved his voice, a voice which was full of music. Imagine my surprise when he asked me to make an album of duets. We met in London and discussed the songs and decided to put in two songs from our own countries, Scottish for Kenneth and Irish of course for me. We recorded the album in the Wigmore Hall in London with full Orchestra conducted by Max Harris, a very well known conductor and composer.We recorded the album in 3 days meeting up to go through the harmonies of the songs to be recorded that day. All the songs were recorded from top to tail (beginning to end ) without any breaks. A little editing was done before the album was released. We listened and looked at each other and seem to feel when to take breaths and finish notes together. We had never sung together before and I have to say that this album is one of my favourites. A lovely man, true professional with a lovely voice and an absolute pleasure to work and to sing with.